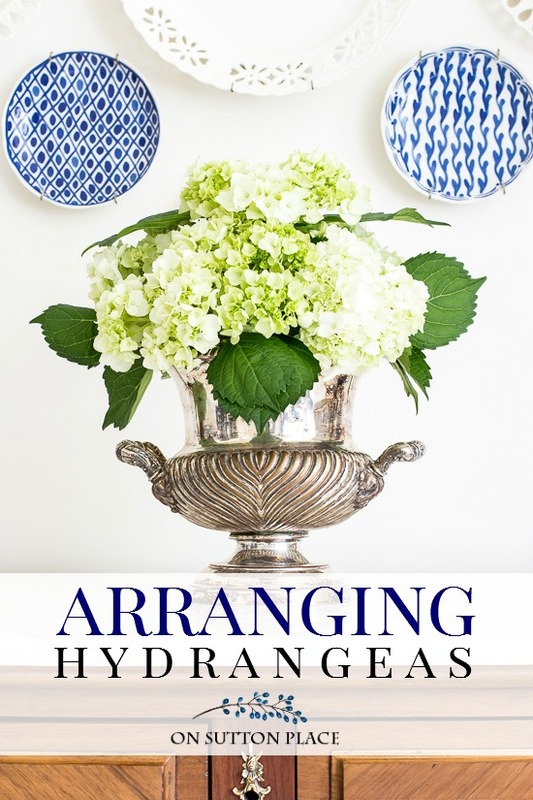 In this post: Arranging Hydrangeas The Easy Way. Simple tips for making your own stunning flower arrangements. 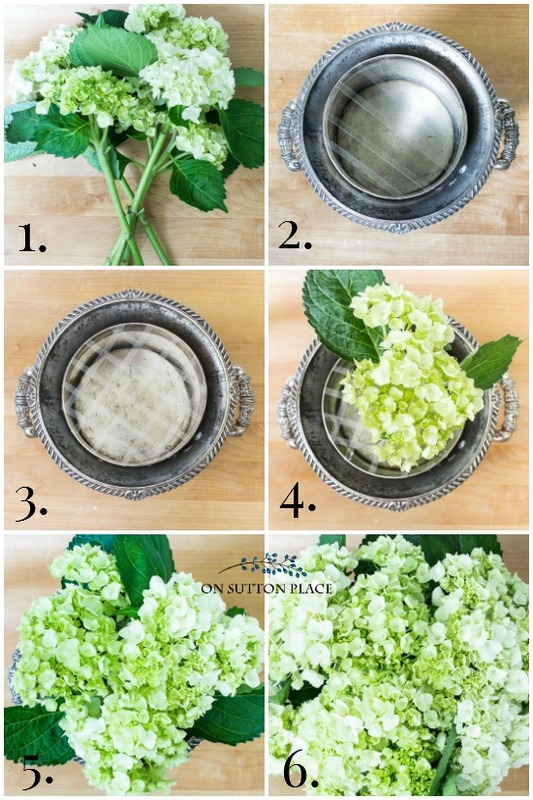 Since hydrangeas are blooming in most growing zones as we speak, I want to share two easy and beautiful ways to arrange them. These methods are perfect for the beginner flower arranger as well as those of you who have been doing it for years. If you don’t have hydrangeas of your own, pick up a bunch or two at your grocery store and try your hand at arranging hydrangeas the easy way! Prepare your hydrangea stems. See THIS POST for details. Fill your vessel with cool water. Make a grid on the top of your container with the florist tape, spacing the rows an inch apart. Add another set of tape rows going in the opposite direction. The second set of rows will crisscross the first set. Place two hydrangea stems in the middle of the grid. Working around the outside edges of the vessel, add more hydrangeas to the grid. Continue to fill in any holes. Make sure and stand back to see that your arrangement is balanced. The tape rows will hold the hydrangea stems in place so the top-heavy blooms won’t fall out of your vessel. The florist tape sticks quite well and can be left on your container to use again. 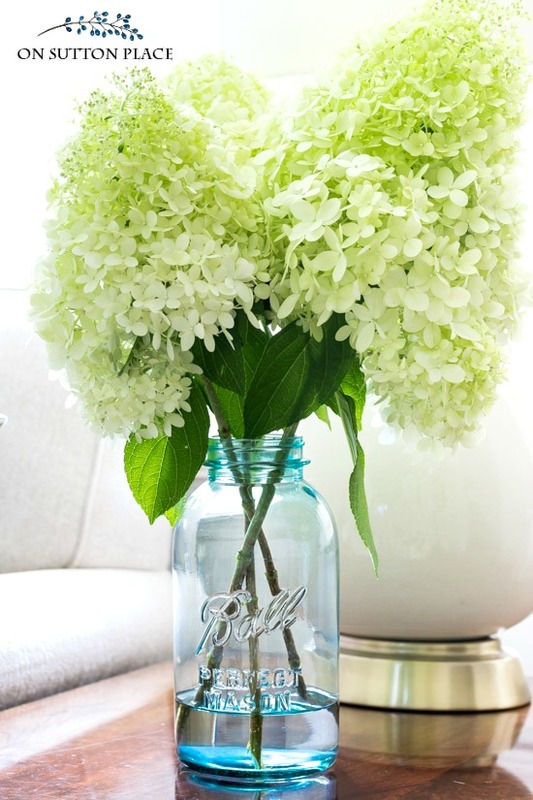 Nothing is simpler than preparing your hydrangea stems and placing them in a mason jar filled with fresh water. This method is easy, fast and absolutely stunning. I have to admit that method #2 is my favorite simply because of my obsession with vintage blue mason jars. However, the tape grid was super simple and I’m sure I will be using it again. 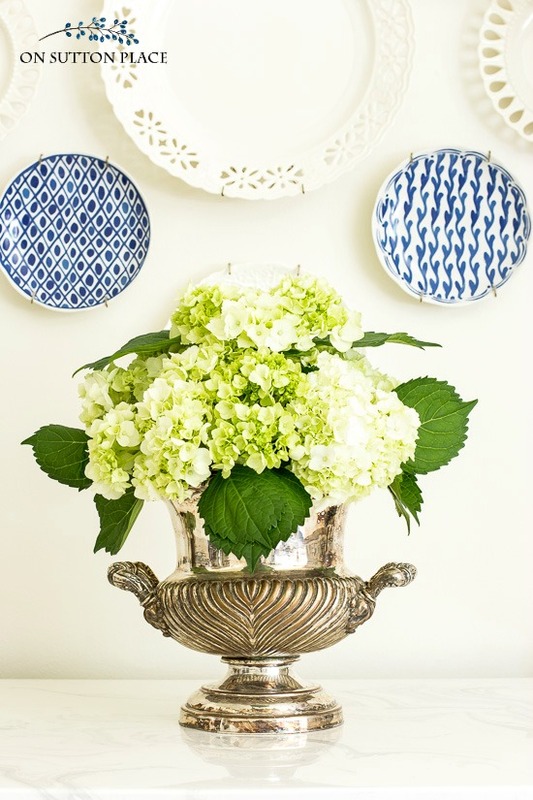 See my series: All About Limelight Hydrangeas. Includes growing, drying, wreath-making and more! I’m happy to tell you that the cherry tomatoes in my container garden are ripening like mad and I was able to make Caprese Salad a few days ago. I don’t use balsamic vinegar so my take on the traditional recipe is a bit different. Get this recipe HERE: Caprese Salad with Cherry Tomatoes. and get this free checklist! Ann, I thought my limelight’s were big last year but the blooms are massive this year and have so many on the bush! I am about to do some arrangements in my house as they make me very happy! Your’s are gorgeous and I also love the updates you have done in your house! Beautiful! I did it right down to the blue glass Ball canning jar. Feeling good as flower arranging has alway been a foreign art to me. Thank you Ann. 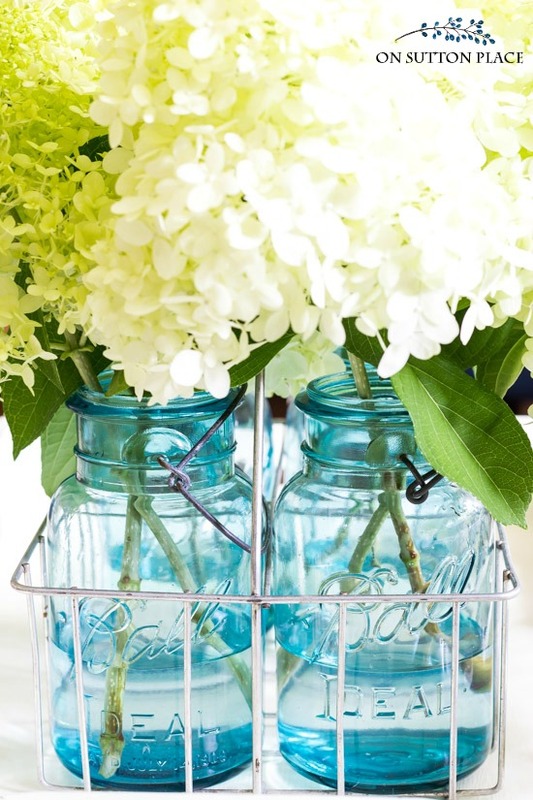 I love the hydrangeas in the blue mason jars. Those blue jars are some of my favorite, too. Also, I will look forward to your Caprese salad recipe because my husband does not care for balsamic. I have spent hours on you website the past two days and love it. In the 90’s I had a navy and white color scheme, navy carpeting, white tile floors, sailor blue sofa, etc but when we moved to this house 10’years ago, my husband wanted brown leather (grrrrr.). Hubby passed away this past year and I want some change and long for my blues. Blue makes me happy. Thank you, for the courage to make the changes, slowly, and with confidence. Carpet and walls already neutral, so will start with an area rug. I consider my style Traditional/French Country. I’m just an Ohio girl, graduated from Fremont Ross, now transplanted to another state. A big hello from one Ohio girl to another! I do similar But put a tall clear glass vase inside my Champagne bucket.I was told by a florist too,as the silver tarnishes & gives off a smell & can kill flowers faster? Do I found the glass vase insert! I love hydrangas, and I have severalof them at my place. They look very pretty in the vase and add a nice look toyour room. Ann – can you tell us what variety of hydrangeas yours are? They’re lovely! The ones in the blue mason jars are limelight hydrangeas. I used grocery store hydrangeas for the silver urn video. Hope this helps! Ann! Thank you! My hydrangeas always look so much prettier on the bush than they do when I bring them inside and try to arrange them. The stems get so unwieldy, my arrangements generally look like they are hanging to one side. I love your arrangement in that gorgeous silver urn, very vintage and so artistic! 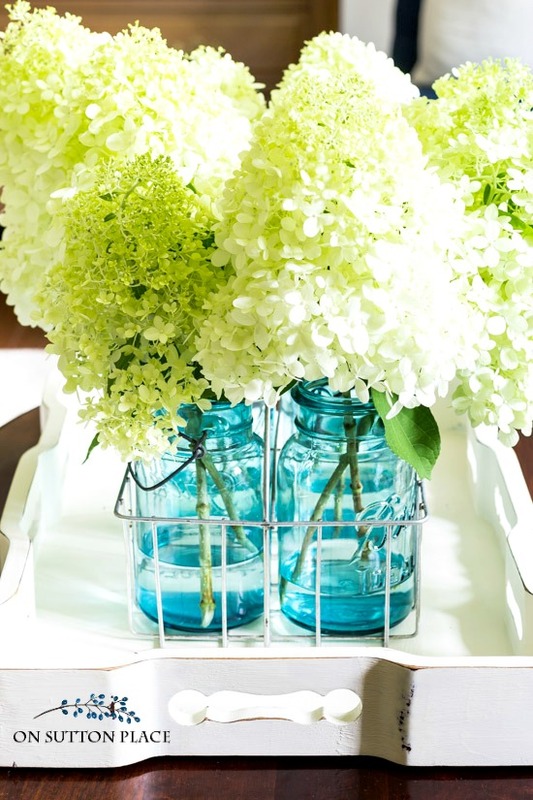 The sweetness of the hydrangeas arranged in your pretty blue mason jars and carrier is perfect for a summer kitchen table. I have a 1/2 dozen blue mason jars stored downstairs, they had belonged to my dear, late mother-in-law. I’ve always thought I should do something pretty with them, NOW I have the very thing to do! As always, thanks for your inspiration! So pretty. Love my hydrangeas. We have had some strong rainy weather and I hate when they get too heavy and bend. I may have to pluck some early to dry. Mine are bending right now too and I think I need to cut some! P.S. Just spotted the article on drying hydrangeas. I think the Limelights need to be in my garden next year! Ha! I sent you a link but you had already found it. Hope it helped! Another great post to pin! I love hydrangeas and actually had some nice blooms this year. Have you done a tutorial on drying them? Hi Donna! Here are all the posts I’ve done on limelight hydrangeas. There is one on drying! 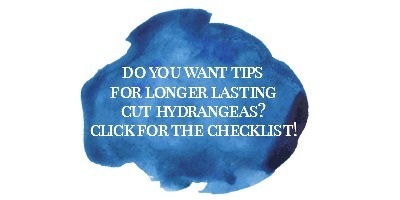 Nice video on arranging hydragenas…now if only mine will bloom..drives me crazy….they are lovely healthy plants. No pruning at the wrong times,good earth was used,they produced flowers last year, not alot but enough to keep me happy.Just makes me mad that I cant pick my own. GRRRR! Hydrangeas are my favorite flower and I have several different varieties of them. I love all your information about them but, was wondering if you have any good tips on an easy way to dry them? Thank you! Hi Wendy! Here are all the posts I’ve done on limelight hydrangeas. There is one on drying! My limelight hydrangeas are in full bloom and I have some blue mason jars too! Thank you so much for the inspiration Ann. I just love your blog nd have received so many great ideas and recipes. You’re the best! I have always struggled with keeping the bloooms in place! I had no idea this was the secret! Thanks for sharing it! I always enjoy your articles, projects and recipes. Thank you for writing them! I made your lavender lemon bread and just loved it! I have one question though, the ingredient list calls for 1 tsp. vanilla, however the recipe doesn’t ever tell you when to add it. I just added it at the end. Delicious! Thank you…I’ll fix the recipe! Just found a jar of alum while cleaning my pantry. This activity was inspired by you! Anyway I will go out this morning and cut some Limelight Hydrangeas and give your conditioning tips a try.Think I will arrange them in an old ironstone soup tureen. Thanks so much for your great blog. I love your style of writing and your house is beautiful. It’s a beautiful year for our hydrangeas. I actually went to our church camp last fall and dug some of Oakland hydrangeas on the side of the road. All of them are just gorgeous. I love to display in mason jars. My hydrangeas haven’t bloomed this whole year, yet they are full and green. What do I need to do? Hi Tya! So sorry for the delay in answering this. I have had years where my Endless Summer and Annabelle hydrangeas didn’t bloom too. I have no idea why this happens. I have tried pruning, not pruning, etc. but there is no rhyme or reason. I think it has something to do with the growing conditions for each particular year but that is a guess. I have had good luck with limelight hydrangeas. I have them in a spot that gets morning sun and they have bloomed every year since I planted them. Maybe give them a try?